A highlight of my studies has been getting articles published in Young Lawyer and Lawyer2B. "In light of the increase in university fees, I felt that it was particularly important to study a subject that would serve me well in whichever direction I choose to take my life. A degree in Law is internationally well-respected and many of the skills that you acquire are transferable to other areas of life. "The topic of law has always greatly intrigued me. The law governs nearly all aspects of our lives and much of my passion for law came from wanting to know more about the rules and regulations that govern me as an individual. "I was keen to gain some experience before applying to university and managed to secure a mini-pupillage in London. While there, I had the opportunity to have an informal chat with a barrister that I'd met at court. We were talking about Law Schools, and when I said that I was from Nottingham, she informed me that Nottingham Law School was one of the best in the country. I did my own research online which supported this and spoke to some current students who were all very positive. Having grown up in Nottingham, it seemed absurd to overlook the brilliant Law School on my doorstep. "I'm glad that I made the decision to study here. The teachers are excellent and always happy to answer any queries I have. I've also found the modules enjoyable and relevant to our everyday lives. Contract Law is a good example as many us had just signed the contracts for our accommodation, the biggest contract many of us had ever signed! "Outside of the classroom, the Law School also provides numerous opportunities for students to improve on their employability skills and gain practical experience in the legal field. 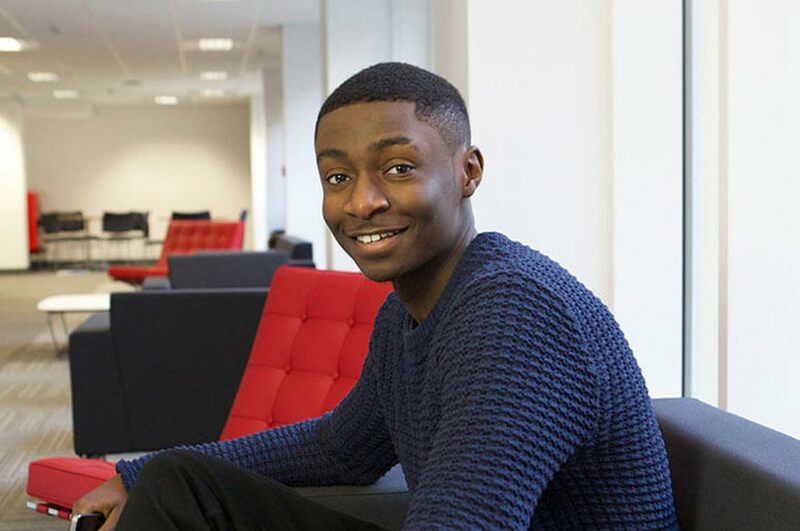 "During my first year I was an Inspire Mentor on Nottingham Trent University's Students in Classroom scheme. My work entailed me visiting a local school twice a week. I carried out in excess of 50 mentoring sessions with five different mentees. I am also a Nottingham Law School Student Mentor and dedicate time every week to helping other students with their work. The pluralistic society we live in means that people with varying backgrounds will be interfacing with our legal system. Mentoring has helped me to gain an incredible insight into the lives and perspectives of others and I feel I can better understand a much wider range of people, regardless of their background. "I am very involved in politics and currently sit as the Nottingham Representative for Young Labour on the East Midlands Young Labour Committee. I have met some amazing people as a result of my involvement within the party and have learned a lot from all of them. "Finally, alongside my studies, I participate in IBM's University Business Challenge with a team of other Law students which has significantly helped in improving my business acumen. "My greatest highlight since becoming a Nottingham Trent University student has been the publication of my articles in magazines such as Young Lawyer and Lawyer2B. From a young age I have been reading such magazines as a source of inspiration. It is a surreal feeling to see my own name in such publications. "Another highlight was securing work experience in a magic circle law firm. The experience was invaluable, and granted me a first-hand insight into life at the heights of the legal profession. It gave me a focus that would otherwise have been unattainable, and allowed me to talk to, and learn from people whom I never would normally have been surrounded by. "I've learned a lot since starting university. My public speaking skills have improved and I've also learned how to explain complex matters in simplified language. Most importantly I have learnt the importance of planning in order to have a productive day. Taking on an increased workload can actually increase productivity overall. It leaves less time for procrastination! "If anyone is considering studying Law at NTU then I would advise them to do it! The Law School provides a lot of support and opportunities for students and I firmly believe that a law degree not only assists you academically, but is also pivotal to personal growth and development."